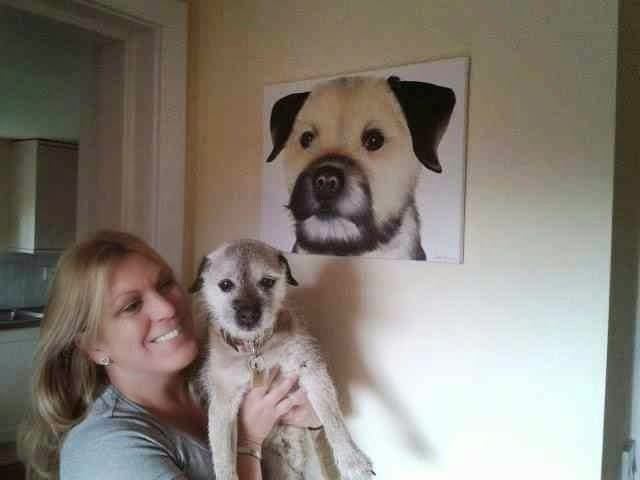 I met Ali at Woofstock where she commissioned me to paint Spud,her cheeky little Border Terrier. Ali runs an excellent dog walking and dog daycare business called the Ministry of Dog, near Wimborne in Dorset. Border Terriers are very energetic, being bred originally to hunt vermin and I'm glad I didn't need him to sit for the painting. Ali sent me a photograph that we both agreed would produce a lovely oil portrait, it seemed appropriate that he was sporting a full mustache in his photo as it was "Movember". His portrait now sits in pride and place on her wall.